Each player has a hand of ten character cards and a starting supply of treasure: one book, one chalice, and a handful of signet rings that come in three types. A harbor with six storehouses is stocked with additional treasures, and three characters – Abbot Remigius, Vitus, and Prior Severus – are placed in the 13-room abbey. For the first round of the game, each player secretly chooses a character card, then they all reveal them simultaneously, with players then carrying out the actions on those cards in player order. 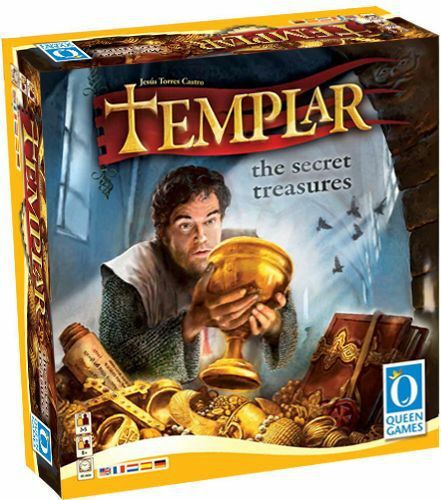 Some characters represent monks who help you move through the abbey and hide treasure, others allow you to take treasure from the harbor, open a locked door while closing off another passage, or move treasure that another player has already stashed, among other things. When a player moves Abbot Remigius, the Abbot rewards all players who have stashed treasure in the room in which he ends his movement, with all of the treasure then being marked as scored – other than duplicate signet rings, which can score again should the Abbot return. (Vitus, who isn’t controlled by a card, follows the Abbot closely to spy upon him, thus keeping the Abbot from returning to the most recent room he entered.) If the Prior Severus is in a room, though, the Abbot can’t do his thing as Severus would then discover the treasure and learn of the Knights’ actions. After the initial round, a player must play a character card that doesn’t match the top character card on any player’s discard pile – which means that you (and others) play both offense and defense with the same character card, restricting the action of others while ideally making good use of the character yourself. When a player lays down The Bells card, he picks up all of his played cards, then restocks the harbor based on the number of his previously played character card.